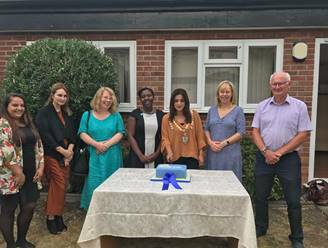 London charity Hestia opened a new self-help centre to support Hestia service users in Hounslow to recover from mental health trauma on Friday 20th July. The charity, which supported almost 2,500 Londoners through mental health services last year, has co-produced the service to support the needs and aspirations for service users in Hounslow who are living in Hestia's mental health and complex needs accommodation based services. The service will host organised activities such as yoga and mindfulness and encourage attendees to share personal experiences to help others with their recovery. Trained staff from Hestia will be on hand to provide any emotional and practical support. "For those experiencing a mental health crisis, access to specialist services is crucial in their recovery. Mental health is often stigmatised leaving individuals embarrassed to come forward and seek support. I am very honoured to open the centre and pleased to see Hestia provide this level of dedicated support to the community in Hounslow." Hounslow residents chose Hestia to receive the community grant award from the local Asda supermarket. Customers were encouraged to deposit a green coin at the exit of the supermarket. "Through our community grant, Asda is able to give back to local charities who work to enrich the lives of our local community here in Hounslow. We are delighted to provide Hestia with our grant that will have direct impact on the recovery of their service users through the new self-help centre."